Pallet & Skid Positioners, Bishamon EZ Loader Pallet Carousels & Turntables, Southworth Pallet Pal Spring Lift Rotator at Global Industrial. Spring-Operated Self-Leveling Pallet & Skid Carousel Positioners are used for breaking down or building up pallets, as the surface automatically lowers and raises as loads are added and removed to maintain a constant working height without overshoot. No power or air supply is ever required, as heavy-duty springs provide long lasting durability. The integral low-friction bearing supported turntable allows nearside loading without reaching. Full 360° access makes loading pallets faster, safer and easier, as it lets the user step closer to the unit's platform for unencumbered access to palletized loads. Wide base offers free standing stability and features fork pockets for easy relocation by a forklift truck. Rugged tubular steel frame and proven linkage design maintains a level height while loading or unloading with no spring bounce. Stainless Steel Frame models offer electroplated springs for maximum corrosion resistance. Air-Operated Self-Leveling Pallet & Skid Carousel Positioners have a Self-Contained Pneumatic System that offers Unsurpassed Performance. A true ergonomic tool! As the load weight changes, the Air-Operated Self-Leveling Pallet & Skid Carousel Positioner adjusts automatically, keeping the top of the load at a convenient working height via a proven pneumatic airbag actuator support system. Totally self-contained and does not require constant air source (requires initial air pressure charge). Forkliftable for easy positioning throughout the workplace. Includes built-in air gauge and pressure relief valve. Rotating ring minimizes worker movement, helping to increase productivity while helping to reduce injuries due to bending and reaching. Heavy duty welded steel construction. Ergonomic Circular Pallet and Skid Carousels reduce Wasteful Motion and Increase Productivity in Material Handling Applications. 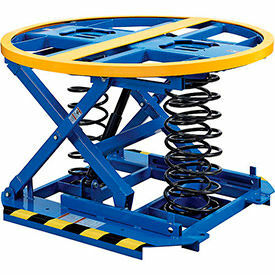 Ergonomic Circular Pallet and Skid Carousels are constructed from strong steel for long lasting durability and strength. Carousel rotates 360 degrees on smooth moving bearings for precise rotation with little effort. 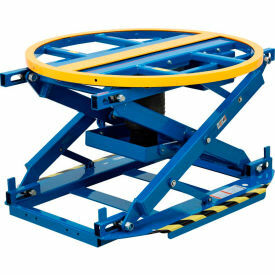 All Skid Carousels can be placed on the floor for easy and unloading of heavy goods. Some styles can be used with an optional Pallet Carousel Stand for additional ergonomic benefits. Capacities are 2000 lbs. to 6000 lbs. Bishamon® EZ Off Lifter® Electro-Hydraulic Pallet Carousel Positioners prevents Excessive Lifting, Bending and Reaching. Bishamon® EZ Off Lifter® Electro-Hydraulic Pallet Carousel Positioners is solidly constructed for long lasting durability and dependability. Maintains pallet load at a convenient working height and provides easy rotation and near-side loading. Electro-hydraulic operation provides infinite height adjustments between the upper and lower travel limits with a convenient push button Hand Control. 1 HP 115V, 1-phase electric motor and a hydraulic power unit that has unitized control valves and reservoir. 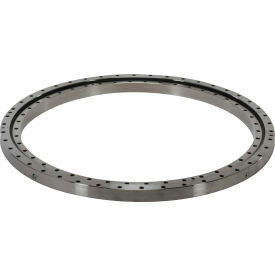 40½" diameter rotating disk is supported by 32 precision ball bearings. Automatic platform lock prevents platform rotation in the lowered position. Feet-clear safety circuit automatically stops the platform descent at 9" above the floor surface, preventing unintentional foot entrapment under the platform or pallet. Warning lights and an alarm alerts before the platform is lowered from the intermediate safety stop. Chain cover is mounted around the upper chain wheel, and pinch point guards are located around the mast and mast rollers for additional operator protection. Lifting tabs and platform catches are included for convenient transport using a forklift. Maximum pallet size is 44" x 48". Durable powder coat finish. 1 Year Limited Warranty. Free-Standing Front Access Lifter includes an integrated hinged approach ramp and rear leveling feet for easy placement in facility. Bolt-Down Three-Position Lifter must be anchored to the floor. Offers a fixed ramp that fits all three sides for multiple point pallet truck access and an integral pallet bumper/stop. 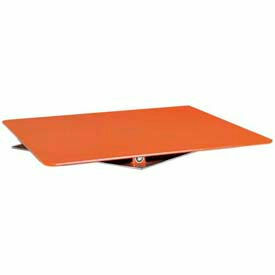 Additional ramps are available to save moving ramp from position. Steel Plate Pallet and Skid Turntables are used for Industrial, Warehouse, Storage and more. Steel Plate Pallet and Skid Turntables are made for long lasting durability. Pallet Carousels can be positioned comfortably improving user efficiency, productivity and safety. Rounded edge corners ensure operator safety. Length dimensions are 36", 42", 48" and 60". Weight capacity is 2500 lbs., 4000 lbs. and 6000 lbs. Dimensions vary per model. Vestil Pallet Carousel Cart Transports Products where they are needed and Rotates Pallets for easy Loading and Unloading. 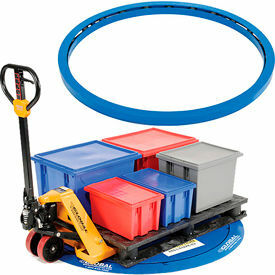 Vestil Pallet Carousel Cart serves as two products in one. The unit utilizes a simple switch on the casters to allow the Cart to manually rotate 360 degrees for improved efficiency. 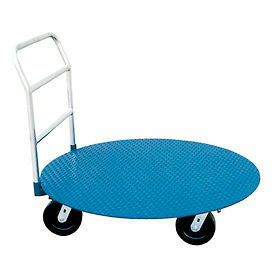 48" diameter platform is made of durable 1/4" thick steel with tread plate surface for improved traction. Platform offers 2000 lb. capacity. Tubular steel handle is removable for full deck access in any position. Cart includes four 8" x 2" phenolic swivel casters with swivel locks. 10"H platform. 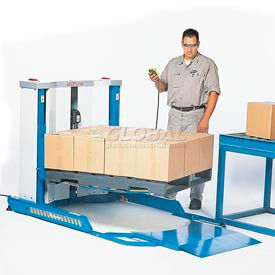 PrestoLifts™ P3 Self-Leveling Pallet Carousel Positioner 400-4500 Lb.